The politics of the ruling class time and time again affirms the famous saying of Marx: “First as tragedy, then as farce.” Here, the ex-Stalinist, now state-capitalist government of Vietnam has asserted its place in both the old tragedy and the new farce with respect to American imperialism. On December 27th, 2015, the White House gave permission to the Vietnamese Navy (“The People’s Navy”) to cruise the seas with American weapons. On May 23rd, 2016, Obama declared this lifting of arms embargo official. Historically, Vietnam would be the first nominally Stalinist state, which the US government continues to refer to as a “communist nation,” to ever complete an arms transaction with US imperialism. And what a place to begin! None other than the home of the brave Vietnamese people, who resisted the barbaric assault of American imperialism in the 1960’s, who endured more bombardments than the sum of all bombs dropped in World War II, and who are still affected by the savage chemical warfare American imperialists waged against them. Unfortunately, despite their eventual victory against the US, the people of Vietnam have lived under a repressive Stalinist bureaucracy backed by Moscow, and it is precisely this kind of bureaucracy, now degenerated to the point of state capitalism, that is capable of conceding to their former enemies in spite of the people’s wishes. Perhaps as a cruel joke of history, the Vietnamese state’s eagerness to deal with the US is primarily motivated by its anxiety vis-à-vis the rising influence of yet another product of Stalinist degeneration, the state of China and the Chinese “Communist” Party. While bourgeois economists laud both China and Vietnam as “success stories” of restoring capitalism while maintaining a repressive bureaucratic government, China’s increasing military and economic strength is seen as a threat by the US which has dominated South East Asia uncontested for decades. China’s strength and its influence on the region has been a cause of rising tension and instability in the region. It led to Japan’s attempt to expand its military operations overseas (again with the backing of Washington) which ignited one of the biggest protests the nation has seen since the 60’s, the Filipino President Benigno Aquino’s fiery comparison of China to Nazi Germany in 2015, and of course, to the Vietnamese ruling elite now embracing US imperialist policy in Asia as they try to play the two larger powers against each other. The conflictive relationship between Vietnam and China can be traced back even to the days when the two countries were deformed workers’ states, right after the Sino-Soviet Split, when Mao proclaimed to be the true flag bearer of Stalin’s “Marxist” legacy, and Vietnam firmly sided with the Moscow bureaucracy. We had the spectacle of small skirmishes and territorial disputes between two Stalinist states – both claiming to be communist- that culminated in the Sino-Vietnamese War of 1979, when Deng Xiaoping ordered an invasion of Vietnam due to concerns over the Moscow bureaucracy’s expansion of its influence into Southeast Asia. What a wonderful result of the theory of “socialism in one country,” which both states still ideologically adhered to at the time! Like China, the Vietnamese Communist government began as a deformed workers’ state in what was another twisted confirmation of Trotsky’s theory of permanent revolution. The Ho Chi Minh led nationalist coalition of Viet Minh initiated the August Revolution shortly after Japan’s surrender after WWII, and entered Hanoi while forcing Emperor Bao Dai to abdicate. With a Stalinist mindset, Ho followed the mechanical application of the two-stage revolution theory by attempting to form a coalition with the Vietnamese bourgeoisie, even offering Emperor Bao Dai a position as supreme advisor. This class-collaborationist strategy not only failed to allow revolutionary operations in the south to succeed, but the reaction of the southern Vietnamese bourgeoisie and American imperialism soon forced Ho, in order to prevent counter-revolution, to edge out all non-Communist elements of the government, nationalize the economy, and institute a bureaucratically-planned economy. Landlordism was ended, and under the planned economy, along with heavy assistance from the USSR and China, North Vietnam’s GDP was able to grow annually at 6% between 1950-1973, in spite of continuous destruction of means of production from war, while the capitalist South only grew at the rate of 3.9% in the same period. At the same time the bureaucracy mercilessly cracked down on attempts to build a worker’s democracy, while wasting no time in persecuting Trotskyists. After the defeat of American Imperialism and the unification of Vietnam in 1975, the Second Five-Year Plan was introduced and applied to the entire country. The plan shifted focus on developing agriculture, which allowed the sector’s production to grow by 18.5%, and industry grew by 12.7% in terms of output. Electricity supply also grew by 50% at the end of the Second Five-Year Plan. Despite the growth, the bureaucratically planned integration of the North and South was poorly carried out. As the country stepped into the 1980's, the bureaucracy's role in planned economy quickly degenerated from a relative fetter towards the asymptote of absolute fetter. This coupled with the waning of Stalinist regimes around the world, led the VCP to make the empirical reaction of embarking on the road to capitalism. In 1985 the state renounced control over commodity prices in hopes of mediating its economic crisis. This instead led the country into even deeper economic problems and the state decided on the policy of Doi Moi in 1986, the Vietnamese equivalent of Perestroika in USSR under Gorbachev, thus setting in place the movement towards capitalist counter-revolution. Today, both the Vietnamese and the Chinese governments are complicit in the same hypocrisy at the expense of their own working class: the bureaucracies have completely abandoned planned economy in favor of sanctioning foreign investments to establish capitalist productions there, while maintaining its repression of the working class by robbing them of democratic political rights and the ability to unionize. According to the Asian Development Bank, 90% of the Vietnamese labor force was employed in the private sector in 2012. The remaining state owned sectors exist mostly with partial private ownership, and are now rapidly being privatized as well. In 2015, the government announced the lifting of the cap of 49% foreign ownership of state owned enterprises, when companies such as VietMilk had already reached such a cap beforehand. In 2007 Vietnam joined the WTO, formally renouncing any control over foreign trade. While we scoff at the anxiety of the US and the clients of its imperialism, China’s own expansionist ambitions are far from fictional. Since the inauguration of “President” Xi Jinping, China has significantly expanded its military presence abroad, in particular in the South China Sea where it is building new artificial islands which are perceived as military threats towards nearby countries. It has also attempted to use its economic weight to influence events on a world scale, for instance by setting up the Asia Infrastructure and Investment Bank which is a competitor to the IMF and the World Bank. It has also compelled Zimbabwe to adopt the Renminbi as a legal currency. 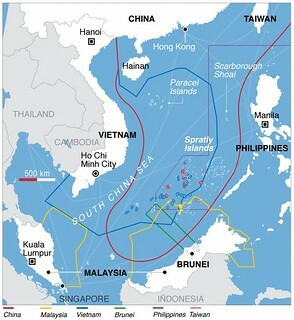 Thus, China’s “peaceful rise” is clashing with predetermined interests of US imperialism and other imperialist powers. We as Marxists, however, do not waste time on condemning individual politicians and states for “destabilizing the regional peace,” but understand that all these economic and security uncertainties are rooted precisely in the development and the current crisis of global capitalism. The relative weakening of western capitalism, now allows for more room for new powers such as China to manoeuvre. This will inevitably lead to heightened tensions and increased instability. The task of Marxists today is more pressing than ever. We need to arm ourselves with skills and knowledge to explain to the working class of Asia and around world that none of these conflicts are necessary, and none of these economic hardships caused by the instability are unsolvable. Only through a Marxist revolutionary program and internationalist outlook can we build solidarity between the workers of countries like China and Vietnam, both of whom have developed a working class that is now the majority within their respective populations due to the economic boom of recent decades. Only the analysis of Marx, Engels, Lenin, and Trotsky can provide us with a correct diagnosis of our problems today, and a solution to a future free from the contradictions of capitalism and the deformities of Stalinism. The proletariat of Vietnam, China, and the world must unite in overthrowing global capitalism.